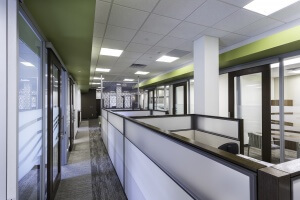 Mohagen Hansen Architecture | Interiors recently provided architecture and interior design services to Highland Bank for a renovation to their St. Paul location on Ford Parkway. The design team worked to incorporate the Highland Bank interior concept which utilizes neutral colors with pops of bright green and blue, emphasizing the brand while creating a fresh, contemporary aesthetic. The Mohagen Hansen team worked to implement new trends in banking such as interactive sit-to-stand universal banking stations. Additionally, we re-worked the drive thru to increase efficiency, and left the client with open tenant space for future leasing opportunities. 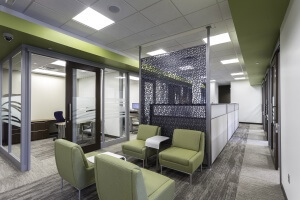 Currently, Mohagen Hansen is also providing space planning, interior architecture, and interior design to Highland Bank for the redevelopment of their current bank in Minnetonka, MN. The new location will incorporate some of the technologies seen in banking today, including kiosks that will be available for customers who wish to complete their transactions by themselves. Highland Bank’s goal was to redesign the lobby to better suit the reasons customers still visit the bank, and to enable their Universal Bankers to efficiently handle all types of transactions. This bank currently under construction, will be located in a new, multi-tenant, mixed-use development on its existing site.